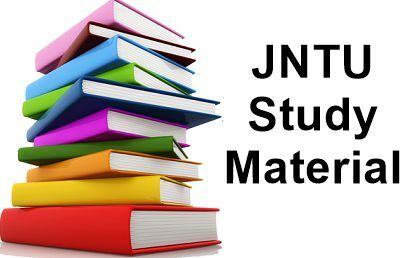 JNTU Study Materials : Jntu Text Books/ Lecture Notes/ E-Books/ Class Notes for B.Tech Students. We have collected All Branches Study Materials Here like civil ,cse, ece, eee, mech, it…etc. So, download the JNTU Text Books/study materials semester wise and branch wise below. Here we are providing the JNTUK, JNTUH and JNTUA Lecture Notes/ E-Books/ Class Notes for 1st, 2nd, 3rd and 4th year Engineering students. Download Complete Books for all branches and semesters. We have tabulated Semester Wise Subject Notes for JNTU Kakinada, JNTU Hyderabad & JNTU Anantapur. We have provided all most all the text books according to the syllabus of JNTUK, JNTUH, JNTUA. Below we have provided Lecture Notes / Class Notes for all Semesters. Simply click on the desire Semester/Branch to download the text books / study materials / e-books. If we missed any of the subjects feel free to comment below, So that we will try to upload those subjects also. We have provided here JNTU Study Materials for Civil Engineering (CE), Electrical and Electronics Engineering (EEE), Mechanical Engineering (ME), Electronics and Communication Engineering (ECE), Computer Science Engineering (CSE), Chemical Engineering (CE), Electronics and Instrumentation Engineering (EIE), Bio – Medical Engineering, Information Technology (IT), Electronics and Computer Engineering (ECE), Aeronautical Engineering (AE), Bio – Technology, Auto Mobile Engineering (AM), Petro Chemical Engineering (PCE), Mining Engineering (ME), Petroleum Technology (PT), Metallurgical Engineering, Agricultural Engineering and all other Major branches which comes under JNTU University. So Keep checking this page and Get all jntu world notes, jntu world study materials, jntu lecture notes. Bookmark this page for further referral and till then Scroll Up and Download your Desired JNTU Materials and JNTU Notes and Materials Exclusively Provided by Us. jntuk text books, jntuh text books, jntuatext books. jntu study materials for 1st year, 2-1, 2-2, 3-1, 3-2, 4-1 & 4-2 semester r16, r15, r13 & r10 regulations. jntu world study materials, jntu important questions, jntuk study materials for civil engineering, jntua study materials for civil engineering, jntu b.tech materials for civil engineering, jntu study materials for cse, jntu study materials for eee, jntu study materials for ece, jntu study materials for ce, jntu study materials for mech, jntu study materials for it, jntu notes for civil, mechanical, ece, cse, it branches, jntu b.tech 2-1 study materials, jntu b.tech 2-2 study materials, jntu b.tech 3-1 study materials, jntu b.tech 3-2 study materials, jntu b.tech 4-1 study materials, jntu b.tech 4-2 study materials, jntuh lecture notes, jntua lecture notes, jntuk lecture notes, jntuk class notes, jntuh class notes, jntua class notes.